A lot of debates rage among historians regarding the first official race held. Most, who have trawled the newspaper libraries of the United Kingdom, now prefer the idea that the first running was in 1836, and was won by The Duke. 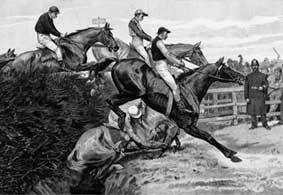 The same horse triumphed again in 1837, while Sir William was the winner in 1838. The first races have long been disregarded because of the belief that the 1837 & 1838 runnings took place at Maghull and not Aintree. Recently several race historians have unearthed indisputable evidence that these three races were all run over the same course at Aintree and were regarded as having been Grand Nationals up until the mid 1860s. These days their calls for the Nationals of 1836-38 to be restored to the record books have been ignored. The first Grand National at Aintree was in 1839 and was won by the aptly named horse, Lottery. During World War I, while Aintree racecourse was closed, an alternative race that hosted events that were still as exciting as modern-day activities was run at Gatwick Racecourse, on the site of the present Gatwick Airport. 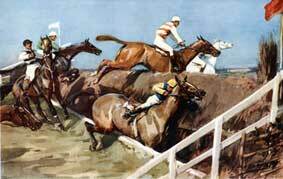 One of the first races when it was brought back, in 1916, was called the Racecourse Association Steeplechase, and in the following two years the race was known as the War National Steeplechase. Its not common knowledge that the races at Gatwick are not always recognised as "Grand Nationals," however, and their results are often omitted from winners' lists. In the 1950's the Grand National was dominated by Vincent O'Brien who took it upon himself to train the winner of the race for three consecutive years between 1953 and 1955. Early Mist won the race in 1953 with Royal Tan winning in 1954 and the hat-trick of victories for the Irish trainer was completed by Quare Times in 1955. The amazing 1967 race was won by rank outsider Foinavon, ridden by Johnny Buckingham, after a melee at the 23rd fence when two loose horses pulled up in front of the field, caused the many others to stop or refuse. Foinavon was running so far behind that Buckingham managed to avoid the incident and scrape round ahead of 17 remounted horses, coming home at odds of 100/1! It is regarded by historians that the most successful horse in Grand National history was Red Rum, the only horse to win three times, in 1973, 1974, and in 1977. He also came in second in the two intervening years, 1975 and 1976. In 1997, the Saturday meeting was abandoned after two coded bomb threats were received, reportedly from the Provisional Irish Republican Army. 60,000 spectators, jockeys, race personnel and local residents were evacuated, and the course was secured by police. The race was eventually run on the Monday, with the meeting organisers offering free admission.. & Over 20,000 people were left stranded over the weekend, with cars and coaches locked in the course. With limited accommodation in the city and surrounding areas, local residents opened their doors and took in many of those stranded, resulting in many friendly parties.. Many renouned jockeys have failed to win the Grand National. These include champion jockeys such as Terry Biddlecombe, John Francome, Josh Gifford, Stan Mellor, Jonjo O'Neill (who never finished the race), Fred Rimell and Peter Scudamore. Presently, multiple champion and record holder Tony McCoy has failed to win the race along with contemporaries Richard Johnson, and Adrian Maguire. Three jockeys who led over the last fence in the National and just lost the race on the run-in ended up as TV racing pundits. These were Lord Oaksey on Carrickbeg in 1963, Norman Williamson on Mely Moss in 2000, and Richard Pitman on Crisp in 1973. The same fate occurred to Pitman's son Mark on Garrison Savannah in 1991.